Installing a door lock can be rather simple or complex, but with the right guidance, any homeowner can install or replace a door lock. In this article we teach you how to fresh install a new lock (drilling the holes needed) or simply changing a door lock by removing and replacing with a new lock. Adding a deadbolt lock to your entry door is typically handled by a locksmith, especially if you’re not comfortable with power tools. But if you are good with tools it is a home improvement project you can take on to add to your safety and security. 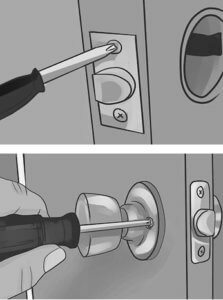 Having the extra bolt in the door increase area by 50%-100% making it much harder to force the door open during a home invasion. But how do you install a deadbolt when there’s no hole? I’m going to tell you. These instructions are general and will work for knobs or deadbolts on wood, fiberglass, or steel doors. A new deadbolt lock and you may need batteries if you are installing an electronic lock. A lock set template or jig. This will make the job must easier than without it and many of the jigs come with the drill bits needed to complete the installation. The favorite from our locksmiths can be found here on Amazon. It comes with the drill bits you will need. Locksmith-Tip: measure your door’s thickness to be sure it is between 1 3/8 and 1 3/4 of an inch. If it is thicker, you will need to order an extension kit for your lock. Decide where you want the lock to be placed. Typically, we place them about six to twelve inches above the door handle or existing door deadbolt. 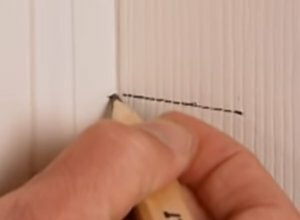 Draw a horizontal line at this point on the interior side of the door and the jamb to mark them. You might find it easier to remove the door from the hinges and work on sawhorses to bore the holes, but it is not necessary. Select the backset on the template/jig. The backset is the distance from the edge of the door to the center of the hole. Typically it’s either 2 3/8 inches or 2 3/4 inches. You’re going to want to match the placement of the existing locks on the door so that they align vertically. Align the template so it’s centered on the line you drew earlier. The template we recommended has a hole so you can clearly see the line at center. In some cases you will secure the template now using any clamp that came with the template. In other cases, the template is held in place by drilling the two 1/8 inch pilot holes on the edge of the door, that will later be used for the latch plate screws, and then using these holes with screws to secure the template to the doors edge. Now use the 2 1/8 inch hole saw to drill the hole (bore the door) for the lock body. Locksmith Tip: To prevent the door from splintering drill halfway through one side then drill the rest from the other side. 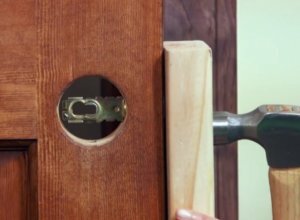 Use a 1-inch drill bit or hole saw to drill the hole on the door edge for the deadbolt’s latch then remove the template from the door. 1. Use the latch plate that came with the locks and trace it on the edge of the door. Then use a chisel to chisel out for the latch plate. It is important to use a good, sharp chisel for this. 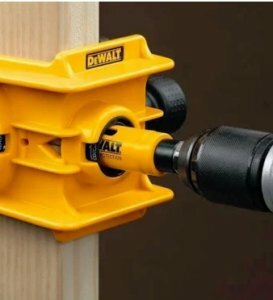 Our locksmiths prefer the Dewalt chisel found here on Amazon. 2. 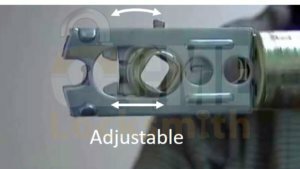 Your lock may have come with a template for the latch plate or you can get them on Amazon. The template is secured to the two pilot holes you drilled earlier and a drill with a router bit can be used to carve out the outside edge of the plate. Then the chisel is used to take out the middle. If you got a template with your lock, this will make for a much nicer installation. 3. The template / jig you purchased may also have come with strike template. You place this template on the door and strike it with a hammer. It will cut groves into the door and then the inside of these groves are chiseled out to make room for the faceplate. The groves created act as a guide and you want them deep to prevent splitting while chiseling out for the plate. We use the strike plate from Kwikset that can be found on Amazon. Your door is now prepped for the lock. Let’s talk about the frame. At the mark made earlier, drill two holes, one above the mark and one below the mark. You are basically drilling a figure 8 with the center of the 8 at the mark you made earlier. Now chisel this out to straighten and flatten the sides. Locksmith Tip: To ensure your new deadbolt locks properly, the hole you have drill must allow the latch to fully extend into it. See Deadbolts – Depth of Hole in Door Frame below. Put your latch up against the hole, centered on your mark, and trace it, or use a provided jig that came with the lock, or use a strike template that came with your template/jig as above to mark the area that you will need to chisel out for the door frame strike. Once the strike area is chiseled out, put the strike in, drill two 1/8 inch pilot holes, and install the strike to the door with two screws. Locksmith Tip: If your strike came with ½ inch screws, throw them away and use two 3” screws for this. The 3” screws will secure that strike to the 2 X 4 stud behind your framing for a huge boost in home security. 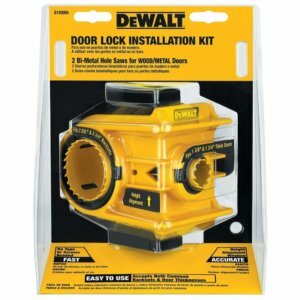 Installing a Door Lock into Existing Holes (that you’ve just created). Most lock products today are built to be affordable, and by that I mean cheap. So, they will eventually stop working and because they are so inexpensive, it is better to just replace the lock than to try and repair it. In this section I am going to talk about how to replace an existing door knob or deadbolt. If you haven’t yet purchased your new door hardware, take a look at our article on our favorite lock brands and our favorite deadbolts. Locksmith Tip: What You Should Do Before Replacing the Door Lock. 1. Take the locks you bought to your local locksmith so they can rekey them to match your existing house key. This way, you will still have one key for every lock in the house and not be stuck with two keys. 2. Before removing your existing door locks, measure the width of your door. Locks you will purchase will all be for standard door widths of 1 3/8 to 1 3/4 inch. If your door is thicker than that you will need to purchase a thick door kit for whatever brand of lock you are installing. Thick door kits contain longer screws and a longer tail peace (for deadbolt) or spindle extension (for door knobs). 3. Note how far away from the edge of the door the lock is. If the center of your lock is 5” away from the edge, you are going to need to buy an elongated latch and bolt. Your local locksmith will carry these, and we encourage you to support your local locksmith. They will make sure you get the right ones for your door locks. But if you want, you can buy them on Amazon as well. Removing the old lock is pretty straightforward. You are going to have a couple of screws in the latch plate. These will be Philips-head screws, they will be short screws, and they will come out very easily. If you don’t have any screws on the latch, no worries. That just means your door lock has a “drive-in” latch. We’ll talk about that in a bit. The next step is to find and remove the two interior screws. 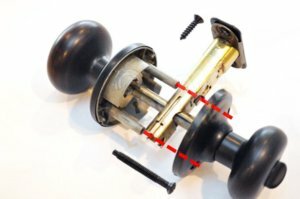 To remove the door knob screws they will clearly be seen on each side of the knob. For deadbolts you may not see the screws. Some deadbolts come with a snap-on cover that conceals the internal screws. You will need to pop that cover off to get to the screws and to remove the deadbolt lock from the door. These screws can be fairly long as they are holding the lock through the width of the door. Once you loosen each screw it will be quicker to remove them by turning by hand than by the screwdriver. When removing these screws it is also helpful to hold the lock in place with one hand while the other hand holds each piece of the lock together. 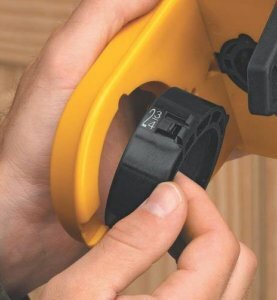 This will keep the tension off the screws so you can quickly remove them by hand and it prevents the lock from accidentally falling out and damaging any tile that may be installed. When the screws are out, both sides of the lock will simply slide off, leaving only the latch in the door. In most cases you can use your fingers in the hole left by the lock to remove the lock’s latch through the side of the door. In two cases this may not be possible. If your lock is a drive-in latch it will be tight. Drive in latches are held in place by compression on a shield around the latch. This type of latch may need to be tapped out with a screwdriver and hammer. Or, if the door is old and it is wedged in tightly, you may also need to tap it out with a screwdriver. This is the time to take note of the door lock’s latch setting. Doors have two common backsets, 2 3/8 and 2 3/4. The new latch needs to be set to the correct one. The existing latch should give you a good idea of which one to use. See if it is in the “short” setting (2 3/8) or the “long” setting (2 3/4). The installation process is essentially the reverse of removal. Installing the new door lock latch. There are three types of latches. Drive-in latches, rounded corner faceplate, and square corner faceplate. If what you are installing is the same as what you have removed it is unlikely that anything will need to be done, the new latch should go in very easily, but consider these things if it does not. Square corner latch going into round corner hole – You will need to chisel out the old rounded corners to install the new square corner latch. Level of skill – easy. Round corner into previously square corner – It will fit but there will be gaps at the rounded corners. They pose no security risk if you don’t mind them or you can putty over them with filler if you do. Level of skill – None. 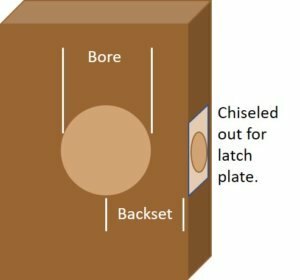 Square or rounded latch plate into a spot that use to have a drive-in latch – This is the most difficult installation as it will require chiseling out to make room for the new latch plate. I’d recommend replacing existing drive in latches with drive latches to avoid this. But if that is undesired or not possible, you can purchase latch guides. The latch guides will mark for you where you will need to chisel. You hit them with a hammer to cut an impression in the door and then chisel out inside of this impression. Level of skill – Difficult. Here’s our favorite by Kwikset on Amazon. Drive-in latch into either of the other two – Also unattractive, but with the correct lock adjustments, no security risk. Level of skill – None. In some cases the new latch plate may be just a bit bigger than the old one and need to be chiseled out to accommodate it. Level of skill – Easy. Installing a drive in latch. Drive in latches are meant to fit snugly. The best method for installation is to push the latch in as far as you can and then place a piece of flat wood tight up against the latch. Then tap it with a hammer to finish pushing the latch into the door. Once the latch is in, I like to install the screws after the rest of the lock is installed. It just give me some wiggle room to make sure everything goes together easily. At this point you want to check to make sure that the center hole in the latch assemble is aligned to the center of the hole in the door. If it is off to the left, or off to the right, the latch will need to be removed and adjusted to the other of its two positions “short” or “long”. Installing the new doorknob or deadbolt. You’re going to want to make sure that you put the lock on the proper side. Obviously we’re going to want to be able to lock the door from the inside and unlock from the outside, so just be cognizant of that when installing the new lock. Start by putting the exterior side of the door knob or deadbolt into the hole. Keyed Locks – When putting in an exterior lock piece with a key hole, be sure that the pins are on the top side of the lock. If it is put in upside down, dust and other debris will quickly fill the pin locations making the lock difficult to use. The lock should be installed so that the cut side of a key, when slid into the hole, is facing up. Before installing be sure to have your local locksmith key your new locks to your existing house key by taking the new locks to the nearest locksmith shop. The exterior side of your door lock has two rods with threads in them that the interior side will need to line up with for the screws to thread into. When placing on the interior side of the door visual line up the holes in the knob (or deadbolt) with the receiving rods when placing on the door. There is also a middle piece. For doorknobs it’s the spindle and for deadbolts it’s the tail piece. If you lined up the screw holes correctly these pieces will naturally align and the two lock sides should slide right together. It’s now time to tighten the screws. Start by simply threading them in by hand. They should go easily and you will be able to tell if you have lined up the receiving posts with the screws by doing it this way. Make sure each screw is threading into the receiving posts before tightening all the way. Locks only work when they are installed correctly and there are two very important things you must check for you lock installation to be secure. See that little extra piece of material on that latch? It’s called a deadlocking plunger. Do you know what’s it’s for? Well, it serves to lock the latch in place so it can’t be moved/slid back into the open position by a credit card or screw driver. It is extremely important for your home security to adjust this when installing door knobs. When the latch is in the out position and the door is closed, the latch should be pushing that plunger into the door. When it pushes the plunger into the door it locks the latch in place so it can’t be forced open (see video below). If the door or strike are misaligned, or if someone has ground out the latch hole too big, the plunger will not be pushed in and the lock with the latch can be very easily bypassed with a credit card or screw driver. One of the tricks locksmiths use to adjust this is to put a little bit of lipstick on the latch plunger. When the door is closed and reopened you should see the lipstick on the stick indicating that the plunger has been pushed in when the door was closed. If you’ve bought yourself a good deadbolt you’ve bought one with at least a 1” throw. That means the bolt will slide out 1” from the door. If your old deadbolt did not throw out this far, the hole in the door may not be deep enough for the new deadbolt and it will not secure properly. When a deadbolt’s bolt does not fully extend outward, it can simply be slid back into the door. Burglars just use a knife or other object to position the bolt back into the door and to bypass it (see video below). When the deadbolt is fully extended, it cannot be pushed back into the door because it locks in place. Test the door when open to see where the thumbturn is positioned when the deadbolt latch is fully outward. Then close the door and test again to make sure that the thumbturn is in the same position. You should be able to either hear or feel when the deadbolt fully extends. 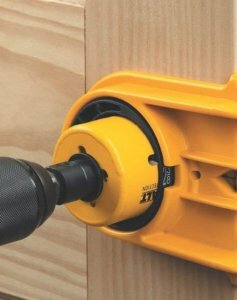 If it does not fully extend, you will need to drill out the hole in the door frame a little deeper until the bolt fully extends into it when the door is closed. There are a number of things you may want to do to your door when changing the locks to reinforce the door and increase the door’s security. Check out our video.